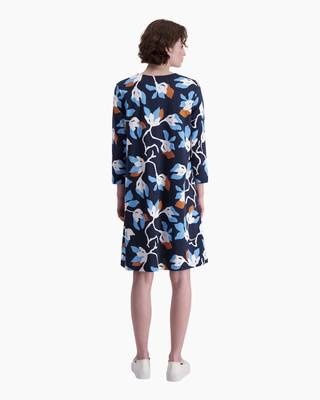 The beautiful off white and blue Mielikuva dress in the Katleija pattern is made of a comfortable cotton jersey. It includes three-quarter sleeves, a round neckline and a hemline above the knee. Main Material: 100 % Cotton Shrinkage max. 6%. Follow the washing temperature given. Wash inside out. Wash with like colours. Reshape to dry.